LifeAct has a low binding affinity, but it perfectly overlies the F-Actin. How is its binding affinity to G-Actin? How can you distinguish lamellopodia and filopodia? Is it known which specific LifeAct domains are bound in actin? Has anyone done automatic image analysis of movies generated with LifeAct-expressing cells? How long is LifeAct stable in living cells, and also in fixed samples? How does LifeAct compare with competing reagents, such as Actin-FP? Is LifeAct like an expression system? Does it generate fusion proteins? Do you have any plans to make an embryonic stem (ES) cell line, or a transgenic mouse expressing LifeAct-GFP? Did you already test LifeAct in primary cultured cells? Was LifeAct also tested with apicomplexan organisms? Have you tried LifeAct for mesenchymal stem cells? Did you try LifeAct with osteoblasts? Which neurons have you tested with LifeAct? When using LifeAct, have you found staining of the growth cones in neurons? Has the LifeAct F-Actin stain already been used with endothelial cells? Have you also tried to transfect tonsilar B cells with LifeAct? What is the difference between using the CMV or CAG promoters in the LifeAct plasmids and adenoviral vectors? How do I resuspend the lyophilized LifeAct plasmid? Which transfection method is the best for working with LifeAct plasmids? Which transfection method works best for neurons, when working with LifeAct? Which transfection method works best for monocytes, when working with LifeAct? With your LifeAct products, what is the transfection rate into cells? Could the transfection with LifeAct be combined with other physical forces, such as electroporation or sonoporation? After transfection with LifeAct, how long does the incubation time need to be, before further studies can be made? How can I transfect cells with mRNA LifeAct-TagGFP2? Is stable transfection possible with mRNA LifeAct-TagGFP2? How long will the mRNA LifeAct-TagGFP2 be expressed? Does the transfection of cells with mRNA LifeAct-TagGFP2 create a genetically modified organism (GMO)? Is there any selection marker that can be used for the selection of stable clones, when LifeAct is transduced into cells through adenovirus? What are the differences between a recombinant adenovirus (rAV) and a recombinant lentivirus (rLV)? What is the difference between a lentivirus and a retrovirus? What are the advantages for using a lentivirus over an adenovirus? How can the LifeAct lentiviral particles be used to make stable cell lines? What final concentration of puromycin is necessary for making stable cell lines? How should premade LifeAct lentiviral particles be used? Can the LifeAct lentiviral particles be further propagated in the lab? Can I extract the vector directly from the LifeAct lentiviral particle? What are the safety concerns when using lentiviral vectors? Why does the intensity of the LifeAct-TagGFP2 signal decrease after the fixation of living ibidi HT1080-LifeAct-TagGFP2 cells with formaldehyde? LifeAct very specifically stains F-Actin in eukaryotic cells, even though it shows a low binding affinity in biochemical assays. The big advantage to this is that there is no influence on the actin kinetics in the living cells. It is a great advantage when comparing LifeAct with Actin-GFP. In biochemical assays, we also found that LifeAct binds to G-Actin with a low affinity. In in vivo experiments, we see a very specific F-Actin staining, with a high signal-to-noise ratio. So, it is not very likely that LifeAct binds G-Actin in a cellular environment, presumably because G-Actin is rarely found in cells without binding cofactors. Lamellipodia are sheet-like protrusions of cells that are, for example, seen in migrating lymphocytes. They consist of a gel-like network of actin filaments that are highly dynamic. Filopodia are spike-like protrusions at the edges of cells that are, for example, seen in neurons or fibroblasts. They consist of thick, parallel bundles of actin filaments. To date, we do not know where LifeAct binds to Actin. As far as we know, there is no publication showing automatic image analysis of LifeAct-expressing cells. For living cells, it depends strongly on the cell-type you are using. For transient transfections, LifeAct can be expressed for 3 to 5 days, depending on the division rate and the original amount of DNA that was introduced. However, with our LifeAct plasmids, it is also possible to generate stable cell lines, if long-term expression is needed. ibidi also offers customized, specific generation of those stable cell lines. For more information, please send an email to [email protected]. There is also the possibility to fix cells after transfection, which will then retain the fluorescence signal for further analysis. In the future, ibidi will be providing a LifeAct peptide for application in immunofluorescence, or biochemical assays. Actin coupled to different fluorescent proteins (Actin-FP), and also used for live-cell imaging, is available from several companies. ibidi, and others, have demonstrated that Actin-FP is less functional than the related, wild-type protein. Plus, it interferes with actin kinetics in sensitive, cellular processes. For cytoskeletal analysis, LifeAct is the best option, as it does not interfere with the cellular dynamics. At the moment, ibidi provides genetically encoded fusion proteins of LifeAct, which are either coupled to TagGFP2, or TagRFP. These versions are available as plasmids, or packaged in adenoviral vectors or lentiviral vectors. At the moment, ibidi is not planning to establish a stably expressing ES cell line. However, we are currently generating a transgenic mouse line expressing LifeAct-TagGFP2, which will be made available to our customers, at a later date. Yes, we tested LifeAct in primary hippocampal neurons and primary dendritic cells. There are also publications showing applications in primary macrophages, keratinocytes, or B-cells. Yes, LifeAct was successfully tested in plasmodium. Deformation of stem cell nuclei by nanotopographical cues, Chalut KJ et al., SOFT MATTER (6) 8, 1675-1681, 2010. Profilin 1 is required for abscission during late cytokinesis of chondrocytes, Bottcher RT et al. EMBO JOURNAL 28(8), 1157-1169, 2009. 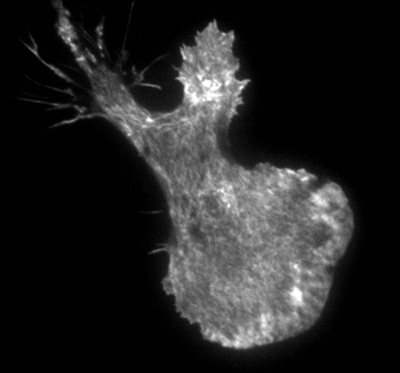 When using LifeAct, we observed a very bright and specific F-Actin staining in the growth cones of polarizing neurons with high dynamics. That staining is typical for this structure. Yes, we used our recombinant adenovirus rAV-LifeAct for the transduction of HUVECs, and achieved very good results with this approach. The Membrane Skeleton Controls Diffusion Dynamics and Signaling through the B Cell Receptor, Treanor et al., Immunity 32, 2010. The promoter that you choose, either CMV (original source: cytomegalovirus) or CAG (original source: chicken, a modified β-actin promoter), will depend on the type of cell that you are using. For many standard cell lines, the CMV promoter is the best choice, because it leads to the strong expression of LifeAct. However, when using sensitive cells, such as neuronal or embryonic stem cells, we almost always recommended using the CAG promoter. It does not have a viral origin, so an interference with cellular defense mechanisms (“silencing mechanisms”) is less likely. Spin the tube containing the lyophilized plasmid. Resuspend the DNA in TE buffer or sterile water by vortexing. If necessary, slightly warm the solution to increase the solubility. Basically, every available transfection method will also work with our LifeAct plasmids. If you already have experience with a specific cell type, we recommend using the same method. If you are new to this field, please refer to published literature, or try different methods (e.g., lipofection, electroporation, or nucleofection) to find the appropriate transfection method for your cells. If you have already experience with a specific cell-type, we recommend using the same method, when working with LifeAct. If you are new to this field, please refer to published literature, or try different methods (e.g., lipofection, electroporation, or nucleofection) to find the appropriate one for your cells. In our own experiments with primary hippocampal neurons, we used nucleofection to transfer the DNA into the cells. If you have already experience with a specific cell type, we recommend using the same method, when working with LifeAct. If you are new to this field, please refer to published literature, or try different methods (e.g., lipofection, electroporation, or nucleofection) to find the appropriate one for your cells. In our own experiments with primary, mature dendritic cells, we used nucleofection to transfer the DNA into the cells. This strongly depends on the cell type, and the transfection method you are using. In general, we get higher transfection rates with our LifeAct plasmids than, for example, with Actin-GFP plasmids. To find the optimal result for your specific cell-type, we recommend testing different procedures and reagents (e.g., ibidi's Torpedo DNA). If your experimental approach requires the combination of transfection with other physical forces, combining them to LifeAct is possible, in theory. Additionally, if you already have experience working with such a system, it should also work with our LifeAct plasmids. In general, many cells already show strong expression of LifeAct fusion proteins, 24 hours after transfection. mRNA LifeAct-TagGFP2 is compatible with all common mRNA transfection reagents, including Fuse-It-mRNA and Fuse-It-mRNA easy. No, stable transfection, and the generation of stable clones, are not possible after mRNA transfection, because the mRNA does not integrate into the genome of the host cell. However, as an advantage, the genome of the host cell is not modified. The mRNA expression duration depends on the cell type and the experimental conditions. Due to the CAP structure and the poly(A) tail, the mRNA is stable and protected against degradation. Generally, one can expect to observe mRNA expression within 1 to 4 days after the transfection. No GMO is generated and no Biosafety Level 1/2 is needed, since the mRNA does not integrate into the host genome. Transduction of recombinant adenoviruses does not lead to random integration into the genome of cells, and therefore it is not possible to generate stable cell lines with this system. If you are interested in generating or using stable cell lines, ibidi also offers a specific generation of those lines, customized to your needs. For more information, please send an email to [email protected]. Lentiviruses are a subtype of the retrovirus. The main difference between lentiviruses and standard retroviruses, from an experimental standpoint, is that lentiviruses are capable of infecting both non-dividing and actively dividing cell types, whereas standard retroviruses can only infect mitotically active cell types. This means that lentiviruses can infect a greater variety of cell types than retroviruses. Both lentiviruses and standard retroviruses use the gag, pol, and env genes for packaging. However, the isoforms of these proteins, which are used by different retroviruses and lentiviruses, are different and lentiviral vectors may not be efficiently packaged by retroviral packaging systems and vice versa. Firstly, the expression level is more controllable. The adenovirus infection typically results either in a bare expression of target proteins or an excessive expression. Sometimes multiple viruses (e.g., 10-20 viruses) can infect just one single cell, which then causes too much protein expression and overwhelms the cellular system. This effect may be unphysiological and will cause different results, depending on the protein expression level. Contrary to the adenovirus, which has multiple viruses per cell, a lentivirus infection is simple, typically containing from one to a few viruses per cell, which makes it much easier to interpret the results. Secondly, no virus protein is expressed. In the 3rd generation of the lentivirus vector, the original virus promoter, located in LTR, is inactivated (SIN vector). Therefore, only the internal promoter-driven protein is expressed. However, the recombinant adenovirus vector expresses a number of virus proteins, so a control virus set-up is essential for interpreting the results. Thirdly, the virus is integrated into the host genome. With an antibiotics selection, it is easy to create a stable cell-line. but cloning is still required. Finally, the host range is wide. With a VSV-G envelop, the virus can infect many types of cells. 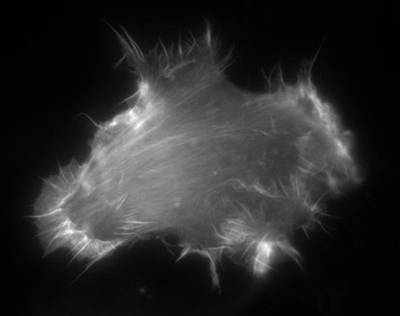 In our experience, this cell type only failed to work in adult cardiomyocytes. Since our lentiviruses integrate into the host genome, it is easy to make stable cell lines by using antibiotic selection. That is, many lentiviral vectors have selectable markers, such as the puromycin resistance gene, which establishes resistance to the antibiotics. When these antibiotics are added to the growth medium transgene, all cells that have not incorporated the transgene will die. The cells that survive can be expanded to create stable cell lines, which have already incorporated the vector and expressed the transgene. In addition, we used an internal ribosome entry site (IRES) element, which permits the translation of two open reading frames from one messenger RNA: one reading frame encoding the recombinant protein (LifeAct-TagGFP2 or LifeAct-TagRFP) and the other the antibiotic resistant marker (Puromycin). Another possibility is to use FACS to separate cells by expressing the fluorescent marker, and later expanding these cells into a cell line. Caution must be taken when establishing a stable cell line. Cloning (typically done by limited dilution) is still necessary, because the phenotype may change by means of passaging. This is due the fact that the virus integrates randomly to a host genome, and there is cell-to-cell variation. With that caution in mind, the antibiotics selection can be done the following way: First, infect target cells at a 20-30% confluence, wait for 3 days until the antibiotics gene is expressed, then incubate with antibiotics (1/2 dose) overnight. Next, re-plate the cells, while increasing the antibiotics to 1 dose. Finally, once the cells become confluent, split the cells and do the experiment. At this point, all the cells are already antibiotics resistant. When creating stable cell lines, the optimal antibiotic concentration, which is toxic to your cells, will need to be determined by performing an antibiotic titration, combined with cell density titration. The concentration range for puromycin and blasticidin is usually between 1-10 µg/mL. MOI (Multiplicity of Infection) is the average copy number of lentiviral particles per target cell genome in the infected cell population, or the number of viral particles per cell. Since not all particles can infect cells, the MOI does not directly correspond to the percentage of cells infected. The MOI is calculated by counting the number of cells and the number of viral particles to be used for transduction. A higher MOI will generate more integration, and as a result it will also generate a higher expression level. To obtain optimal expression for your specific application, a range of MOIs (e.g., from 1 to 10) should be tested. Theoretically, an MOI of less than one (such as MOI = 0.3) should be used to achieve single copy integration. Practically, at MOI = 0.3, only 5%-20% of the cells will be transduced, depending on the cell type, and the majority of transduced cells will only have one copy of insert. ibidi’s lentiviral particles are already ready to use. Simply add the calculated amount (depending on the requested MOI) of particles into the culture medium of the cells (ibidi recommends using a 24-well plate). Within 48 to 72 hours, check the viral transduction efficiency by visualizing the fluorescent signal under a microscope (Note: some cell types need more time to see the fluorescent signal, and fluorescence visualization in some cell types may require up to 10 days). Some additives, such as polybrene, can enhance the transduction efficiency. Also, many factors can affect transduction efficiency, the main one being the cell type. An actively dividing cell line gives a much higher transduction rate than non-dividing cells, therefore, if you are transducing non-dividing cells, a higher MOI should be used for optimal expression. No, the viral particles cannot be propagated for biosafety reasons. The LifeAct lentiviral particles are replication incompetent. The particles are made using features of 2nd and 3rd generation lentiviral packaging systems. Genes for replication and structural proteins are absent in the packaged viral genome, since these genes are supplied by other plasmids in the packaging cells. The viral genome contains only the region between the 5’ and 3’ LTRs of the pUbi-LifeAct-TagGFP2 or the pUbi-LifeAct-TagRFP. In addition, the lentiviral vector contains a self-inactivating 3’ LTR that renders it unable to produce an infectious virus once it integrates into the host chromosome. What is the difference between 2nd generation and the 3rd generation lentivirus plasmids package system? For a number of years, researchers have been investigating HIV gene products to determine the minimal requirements for generating a functional lentiviral vector (Miyoshi et. al. J. Virology 72:8150, 1998), which eventually became the 1st generation of lentiviral vectors. The 2nd generation was created to split these essential genes into separate expression vectors, and also to exchange the envelop from original virus to that of a vesicular stomatitis virus (Burns et. al. Proc. Natl. Acad. Sci. USA 90:8033, 1993). It has an original LTR promoter activity that expresses some viral structural proteins along with the inserted gene of interest. To package the virus, the 2nd generation vector requires a Tat protein expression vector (Dull et. al. J Virology 72:8463, 1998). In the 3rd generation vector, the original U3 region of the LTR was modified to make the virus self-inactive (SIN vector: infected cells do not express viral structural proteins). This generation of the lentivirus vector expresses only the internal promoter-driven gene of interest. ibidi’s LifeAct Lentiviral Vectors can be considered to be “4th generation”, because they employ a sophisticated packaging system that reduces the recombination risk. However, the vector itself has an original LTR, which categorizes it as a 2nd generation Lentivirus. These concerns can be primarily reduced by choosing specific vector designs and also by using safe laboratory practices. In terms of vector design, 2nd and 3rd generation lentiviral systems, provided by Addgene, separate the transfer, envelope, and packaging components of the virus onto different vectors. The transfer vector encodes the gene of interest and contains the sequences that will be incorporated into the host cell genome, but cannot produce functional viral particles without the genes encoded in the envelope and packaging vectors. Unless recombination occurs between the packaging, envelope, and transfer vectors, and the resulting construct is packaged into a viral particle, it will not be possible for the viruses that are normally produced from these systems to replicate and produce more viruses after the initial infection. In this regard, 3rd generation systems are considered safer than 2nd generation systems, because the packaging vector has already been divided into two separate plasmids (resulting in a four plasmid system, in total). In addition, 3rd generation systems do not use the HIV protein Tat in order to produce a full-length virus from the transfer vector during the viral production stage. The self-inactivating (SIN) vectors have a deletion in the 3’LTR of the viral genome that is transferred into the 5’LTR after one round of reverse transcription. This deletion abolishes the transcription of the full-length virus after it has been incorporated into a host cell. The potential for oncogenesis is largely based on the specific insert that is contained within the lentiviral transfer vector (dependent upon whether or not it is an oncogene) and should be determined on a case-by-case basis. Biosafety Level 2 (BL2) is appropriate for most of the applications when using lentiviral vectors, but biosafety should always be considered with respect to the precise nature of the experiments being performed. The NIH provides more information on lentiviral safety considerations here. The intensity decreases, because formaldehyde, glutaraldehyde, alcohol, etc., denatures the GFP. Therefore, GFP is no longer functional. Any remaining fluorescence is either non-specific (many proteins auto-fluoresce after fixation) or just a few GFP molecules that retain their original conformation. If cells are fixed, you should use an additional, anti-GFP antibody to detect the GFP.